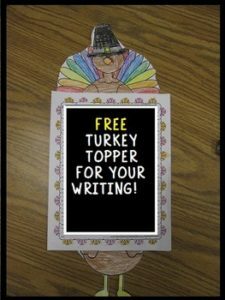 Enjoy this free turkey topper for your Thanksgiving writing activities. It’s part of my Disguise a Turkey activity for grades 2-3. If you like the writing paper, you can grab it below. There are 70 different designs for use throughout the year. DISGUISE A TURKEY in my store. Do you teach K-1? Check out TURKEY TIME that includes emergent readers, math activities, and so much more.I’m So Fancy Writing Paper Freebie Included!